"I don’t think there could possibly be a better term to describe street gaps as “something out of nothing”. For something that isn’t even really a “spot”, the street gap has become a standard amongst street skateboarders and bmxers alike. The ability to do bigger and different things over the gap only adds to the functionality. You could do everything from a kickflip to an ollie, a barspin to a truckdriver, f*ck it, you could do a laserflip and it would still be rad. 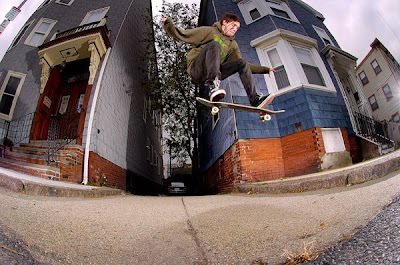 Without over analyzing something that is relatively simple, street gaps are fun because they are in every city and they all go back to the root of BMX and Skateboarding, jumping over things. Which, in my own opinion, is best part. The skate photo above is by Xeno and was seen on Focus Skate mag."